Ashampoo AntiVirus will give you comprehensive protection against viruses, Trojans, worms, Trojans and dialers, but it's so efficient you won't even notice it's there. And it's so easy to use that it won't waste any of your valuable time. Just set it and forget it and get on with more important things. Once you have installed Ashampoo AntiVirus protection is automatic. It checks all new files and activity on your computer for both known threats and suspicious behavior and stops attacks before they can do any damage. Malicious hackers are creating new threats every day and an antivirus program is only as good as its updates. Ashampoo AntiVirus recognizes over 470,000 different threats. It comes with a year of free updates and the virus signatures are updated several times a day with information on the latest threats. Just switch on automatic protection and update checking and let the program take care of everything else for you. You don't need to know everything that Ashampoo AntiVirus does to protect you but it may interest you: It doesn't just scan email attachments and new files for threats. It also scans your computer's memory and all critical system areas. If you want you can also define your own customized scans to perform systematic checks of all or part of your system, including removable media like CDs and DVDs and even external and portable devices. A special intelligent system known as heuristics analysis is used to identify as-yet unknown threats on the basis of suspicious behavior and stop them before they can do any damage. When infections are found you can choose to clean them immediately or you can put them in quarantine. This is a special protected area where the infected files cannot do any damage but they can be recovered if necessary - for example if you discover that the threat identified was harmless. All the operations performed by the program are recorded in detail in log files. You can view the contents of the logs at any time.A context menu item is added to Windows Explorer that enables you to scan files directly without starting Ashampoo AntiVirus. · Comprehensive protection: Protects against over 470,000 viruses, worms, Trojans and dialers. Scans all critical system areas, memory, emails and files. · Simple to use: Very intuitive user interface, no previous knowledge required. Configuration with slider controls that automatically display the settings. · Low system load: You won't notice it's there so you'll never feel tempted to turn your protection off. · Daily updates: The virus signatures are updated several times a day and the program checks for updates automatically - every hour if you want. A high-speed server prevents update delays. · Multiple scan modes: Automatic protection while you are working plus manual scans and scheduled scans performed automatically. · Quarantine: Move infected or suspicious files to a locked quarantine area where they can't do any damage. · Windows Explorer integration: Adds an option with which you can scan files for viruses directly in Windows Explorer. · 128 MB RAM, around 40 MB for the program files. · Microsoft Internet Explorer 5.0 or higher is required. You cannot download any crack or serial number for Ashampoo AntiVirus on this page. Every software that you are able to download on our site is legal. There is no crack, serial number, hack or activation key for Ashampoo AntiVirus present here. Our collection also doesn't contain any keygens, because keygen programs are being used in illegal ways which we do not support. All software that you can find here is freely downloadable and legal. Ashampoo AntiVirus installation package is prepared to be downloaded from our fast download servers. It is checked for possible viruses and is proven to be 100% clean and safe. 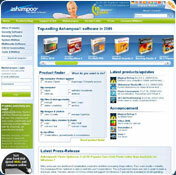 Various leading antiviruses have been used to test Ashampoo AntiVirus, if it contains any viruses. No infections have been found and downloading Ashampoo AntiVirus is completelly problem free because of that reason. Our experts on malware detection tested Ashampoo AntiVirus with various spyware and malware detection programs, including fyxm.net custom malware and spyware detection, and absolutelly no malware or spyware was found in Ashampoo AntiVirus. All software that you can find on our servers, including Ashampoo AntiVirus, is either freeware, shareware or open-source, some of the software packages are demo, trial or patch versions and if possible (public domain licence), we also host official full versions of software. Because we want to be one of the fastest download sites on the web, we host all the software including Ashampoo AntiVirus on our servers. You cannot find here any torrents or download links that would lead you to dangerous sites.